Recently I was playing around with crochet thread color combinations and was really pleased with this one. 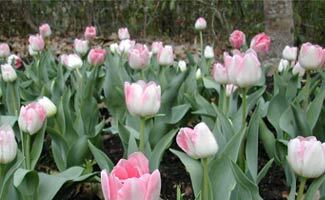 It reminds me of pink tulips in the spring, like these we planted a couple of years ago. The pattern is called Lavender Bookmark and it’s from the booklet How to Thread Crochet on a Roll from Annie’s Attic . I used size 10 cotton crochet thread, but it didn’t have labels, so I can’t list specific brands and colors. Around the edge, I added 20 clear seed beads, which are not called for in the pattern. When I was done, I felt like the bookmark wanted to be a gift, and so I sent it to my dear friend, Julie. :) :) :) And it’s so darn pretty, Donna! It stayed in the Jane Austen Collection until I finished them all, now it’s waiting for the perfect book to hang out in again. I love it! It’s gorgeous… and I’m jealous of your pink tulips, fantastic! Gorgeous lovely stunning bee-yoo-tiful!!! (Tulips are my favorite flower.) I’m a threadie but I haven’t even tried the bullion “roll” stitch yet. Well done! how beautiful.. tulips are one of my faves in spring..
It’s very pretty. I like the seed bead idea, too. Love the colours. That’ll brighten anyone’s day. Cheers. that is gorgeous! i love your tulips as well – they are my favorite! very nice work… i just got a ‘on the roll’ book- i’m nervous to try… is it terribly hard? That is so pretty, and it DOES look like tuips. The roll stitch kinda resembles tatting…very nice! I adapted some of Bonnie Pierce’s free patterns into thread from her site of yarn squares, and they turned out very stunning. I showed them to her and she was impressed. (She’s impressed by anyone who can do the roll stitch.) I love the pink, blue, and purple one you did for your swap, too! That’s perfect! Looks just like them! What a lovely bookmark. Those colors really work! Wow – you captured the colors brilliantly. Wonderful Work!